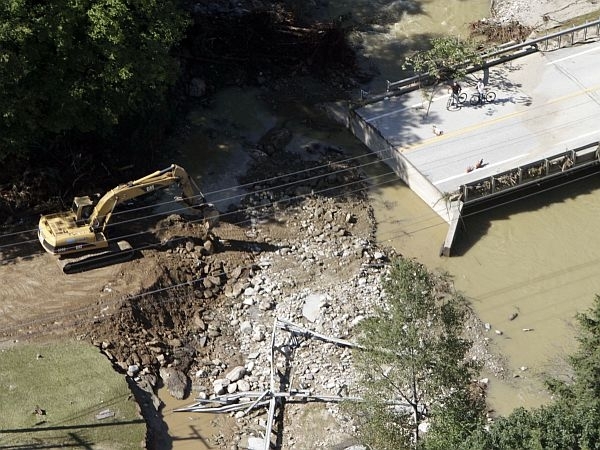 (Host) Among the teachable moments from Tropical Storm Irene is a new approach to bridge repairs designed to save time and money. The state has plans to apply those lessons to bridge projects this summer and it’s offering incentives for towns to do the same. (Zind) Between the big spans on the aging Interstate and an even older group dating back to the 1927 flood, Vermont has its bridgework cut out for it. (Cole) "In order for us to repair those bridges we’re going to need to either, A: Raise a lot of revenue through the gas tax or, B: Figure out a more efficient way to do these bridges." (Zind) Chris Cole is Director of Policy, Planning and Intermodal Development for the Agency of Transportation. He says the state has chosen Plan B to fix bridges. That means closing one-third of the state bridges scheduled for work this year instead of taking the more standard approach of building temporary roads and bridges to re-route traffic while work is under way. (Cole) "We plan on re-creating without the storm affects the closures that Irene forced upon us where we were able to employ some of these techniques for the first time where Vermonters got used to have bridges closed and then have them reopened in some instances where they were brand spanking new." (Zind) Cole says doing it the old way involves planning and engineering a temporary bridge, getting permits for the necessary rights of way and dealing with traffic control. That can add years to a project and run up the bottom line significantly. Under the new accelerated program, a bridge that takes up to 10 years to plan and build might now take two years. It won’t work to close every bridge that needs repairs, but Cole says it will for many. The state also wants the towns to get involved. The new transportation bill in the legislature now includes a provision that ups the state share of a town bridge project and reduces the local share by half if the streamlined approach is followed. So a town would only have to pay 5 percent. The town of Bristol hopes to take advantage of the program to repair a bridge closed since 2010. Town administrator Bill Bryant says Bristol would save $117,000 under the accelerated bridge program. (Bryant) "That’s a significant amount of money for a small town. Our road budget is probably in the $600,000 to $700,000 a year range." (Zind) Bristol would bond for the bridge expense and pay it back over 20 years. The state is taking other steps to cut down on bridge work costs. One is to adjust the bidding process so contractors will be rewarded for the cost of a project and the speed with which they work. The state also plans to build more of the structural components of a bridge off-site and then truck them to the location to cut down on the time and disruption of a project. The town of Bristol is headed to court over a proposed gravel pit near its downtown. At issue is whether this old lumber town should permit a project that supporters say could bring much-needed revenue and industry. Bristol is headed to court over a problem facing many other towns: whether its town plan should permit gravel extraction that supporters say could create much-needed jobs.